TG Connection presents information drawn from The Technology of Love, a well researched 30+ year scientific study on Love. In his research spanning over three decades, Charles E. Hansen has put Love “under the microscope”, studied Love’s properties and analyzed its nature at the deepest levels in order to understand exactly what Love is; how and why it works. Hansen’s research and discoveries, published in his 583 page volume, The Technology of Love, reveal the new science of Love. For the first time ever, this previously elusive, largely indefinable aspect of human interaction, which we refer to as Love, has been scientifically classified and organized resulting in an ordered “system” of Love. Its causal factors, elements and vectors have now been defined. Mathematical in its perfection, Love is as real, discernible, and uniquely powerful as electricity. But don’t worry, even though these scientific terms and analogies seem rather cold and formal, Love retains all its warmth and appeal! The good news is that this remarkable, life changing information is now available to all! The Technology of Love, gives mankind a blueprint to follow for building healthy, happy relationships at every imaginable level. Happiness and renewed hope are at our fingertips! The Technology of Love has the power to help us inject new life and joy into relationships, change our lives and make the indispensable light of Love readily available to our needy world. 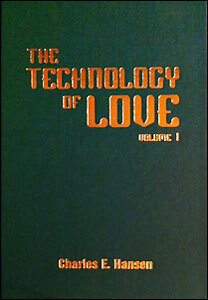 The Technology of Love, a very scholarly and scientific volume, is available at www.corsense.org or through amazon.com More information about the author, Charles E. Hansen, can be found here. Click here for Scientific and Spiritual excerpts from Hansen’s book.